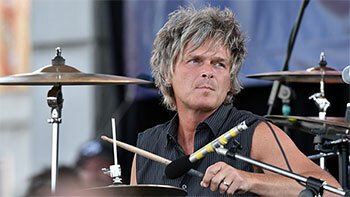 Jeffrey John Burrows, born August 19, 1968, is a drummer and percussionist from Windsor, Ontario. He is known for being a member of the Canadian band The Tea Party. Drawn to music early on, Burrows was drumming by the time he was 11. Not long after, he began sharing his skills as a drumming teacher. In 1990, his passion for music led him and two of his friends from high school, Jeff Martin and Stuart Chatwood, to form The Tea Party. Offering a unique blend of genres, The Tea Party has produced multiple albums and toured extensively. They disbanded in 2005, after which Burrows pursued other projects, including recording a song for Trailer Park Boys: The Movie. In 2011, the three members of The Tea Party reunited, and have been producing new music and touring Canada ever since. Burrows is deeply devoted to charitable works, and has often used his music as a way to achieve philanthropic goals. He has been part of the White Ribbon Campaign, devoted to ending violence against women; the Motorcycle Ride for Dad, dedicated to raising funds for prostate cancer research and education; and Transition to Betterness, a Windsor charity focused on providing support to local cancer patients and their families. His most well known charitable endeavour, though, may well be as part of the Windsor band The S’Aints. Burrows plays drums and percussion for the band, which has been working alongside St. Clair College since 2013 to raise funds to help feed people in the community. Every year the band hosts a concert and produces a holiday themed album around Christmas time. As of 2018, the group has raised more than $266,000, with the funds going to such organizations as the Unemployed Help Centre.